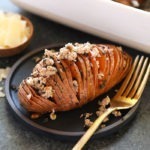 Hasselback Sweet Potatoes have never been easier! 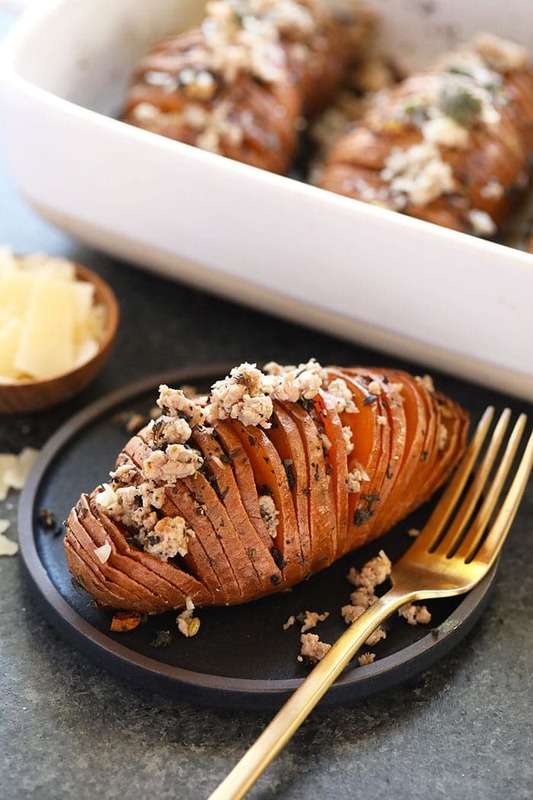 This delicious hasselback potato recipe combines protein-packed sweet potatoes with savory herbs and garlic, and is topped off with Italian sausage and goat cheese. These will jazz up any dinner table! 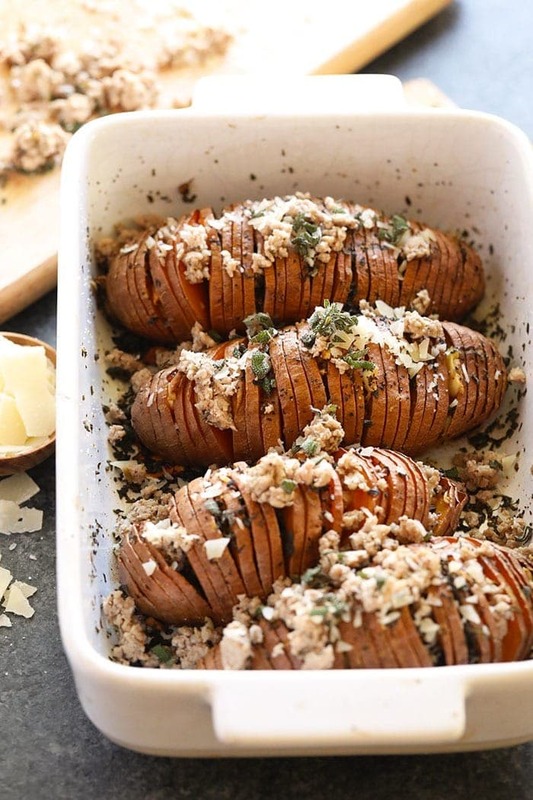 We LOVE hasselback potatoes for a few reasons here at Fit Foodie Finds. One, because the way you prepare it allows the flavors to seep into the entire potato, making it extremely flavorful. YUM. It also really jazzes up your tater. If you are making these for a dinner party or trying to impress someone (wink), it’s an great way to make the presentation look gawgeous. 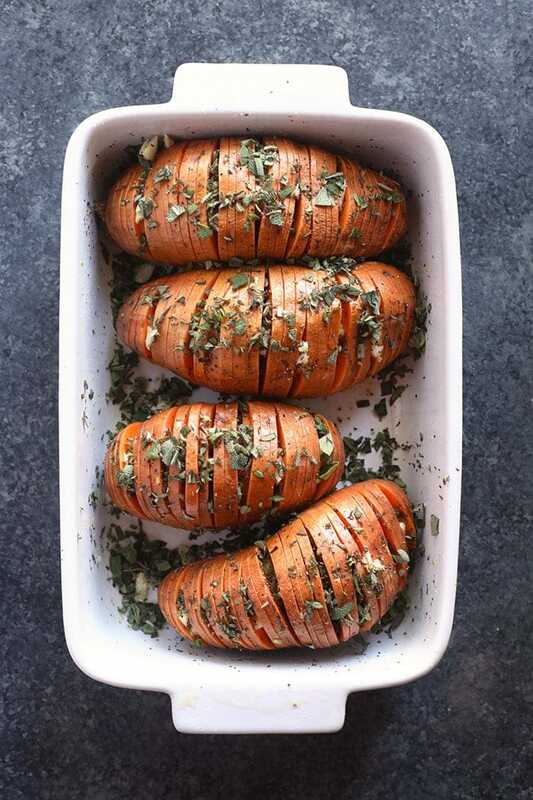 Step up even any ordinary meal with these beautiful hasselback sweet potatoes that are seriously easy to make. 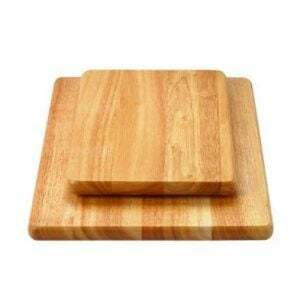 –Make sure you’re using a VERY sharp knife. 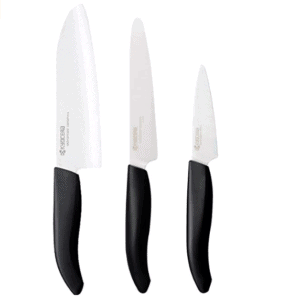 We use this ceramic knife. Since raw sweet potatoes are much more dense than other types of potatoes, you’ll want a very sharp knife to ensure that you can carefully slice. 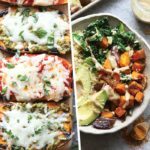 –Before you slice your sweet potatoes hasselback-style, flatten the bottom of your tater by cutting length-wise on one side to create a flat side for you to slice your hasselbacks. 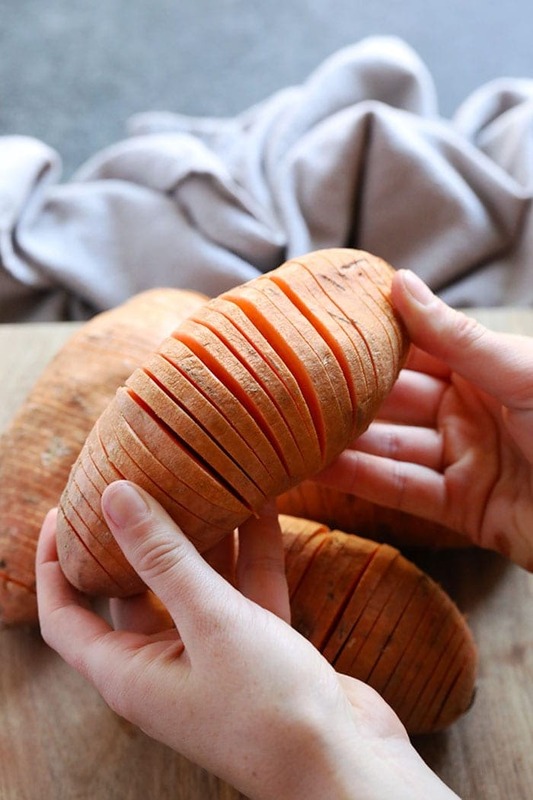 –When you slice your sweet potatoes hasselback-style, use metal straws or chopsticks and place them on either side of your sweet potato to ensure that you don’t slice all the way through your tater. 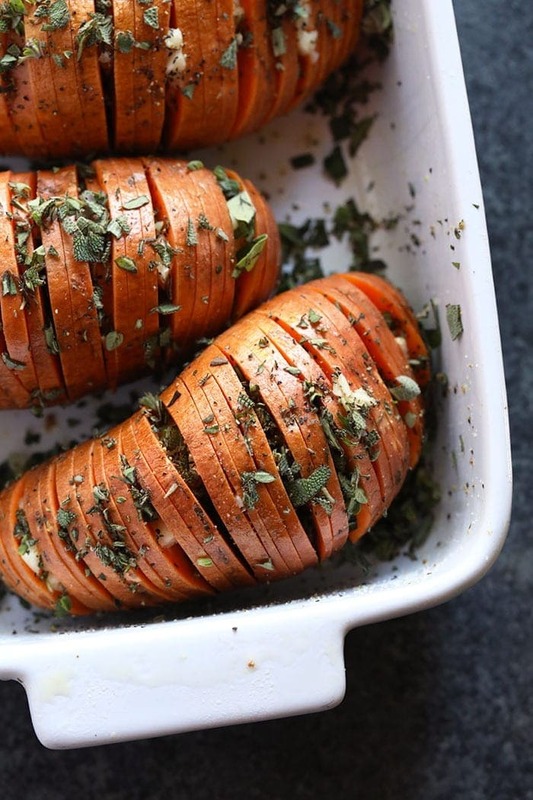 This will leave the perfect amount of tater connected on the bottom edge of your hasselback potatoes. 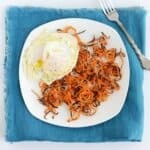 –When drizzling your sweet potatoes with olive oil and seasoning with spices and herbs, try and get olive oil and your spices and herbs in between each of the slices. –Feel free to get creative with how you season your hassleback potatoes. Craving something specific or trying to match the theme of the rest of your meal? Season these bad boys however your little heart desires. 1. First, preheat oven to 400F and line a baking dish with tin foil. 2. Next, wash sweet potatoes and pat dry. 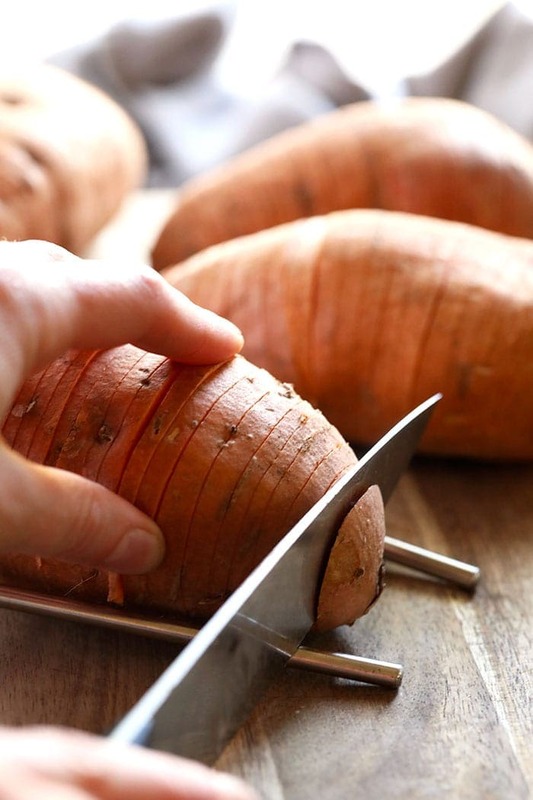 Using a sharp knife, slice sweet potato as finely as possible. Make sure you don’t go all the way through. 3. Drizzle with EVOO and lather with garlic. Try and get the garlic in between each slice.4. Generously season with salt and pepper. 4. Bake at 400F for about 45 minutes or until you can easily pierce the sweet potato with a fork. 5. While sweet potatoes are baking, heat a medium skillet over medium/high heat. Cook Italian sausage until sausage is browned (about 6-8 minutes). Remove from heat. 5. Top sweet potatoes with goat cheese and Italian sausage* and serve. *Feel free to omit Italian sausage to make this a vegetarian dish!